Provides additional formatting behavior for source file comments. The Comment Formatter extension provides additional formatting behavior for source code comments. The most prominent feature is the support for italicization, which can be configured for normal and documentation comments independently. Another feature is fading out of documentation tags. When enabled, all tags within a documentation comment will be displayed semitransparent instead of opaque, which makes them less obtrusive and turns the focus back on the content. Last but not least, the Comment Formatter extension allows you to style single-line and block comments individually. The configuration settings can be found in the Options dialog under Extensions/VSEssentials/Comment Formatter. 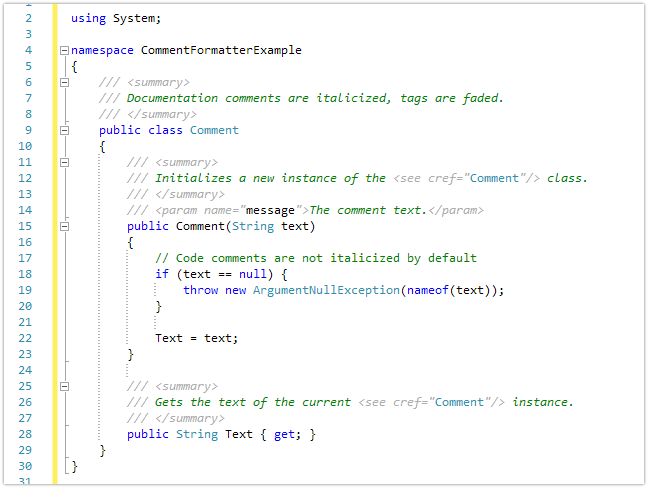 By default, documentation comments are italicized and tags are faded, while italicization for code comments is disabled. The style settings for single-line and block comments can be found on the Fonts & Colors page in the Options dialog. By default, block comments are boldface.